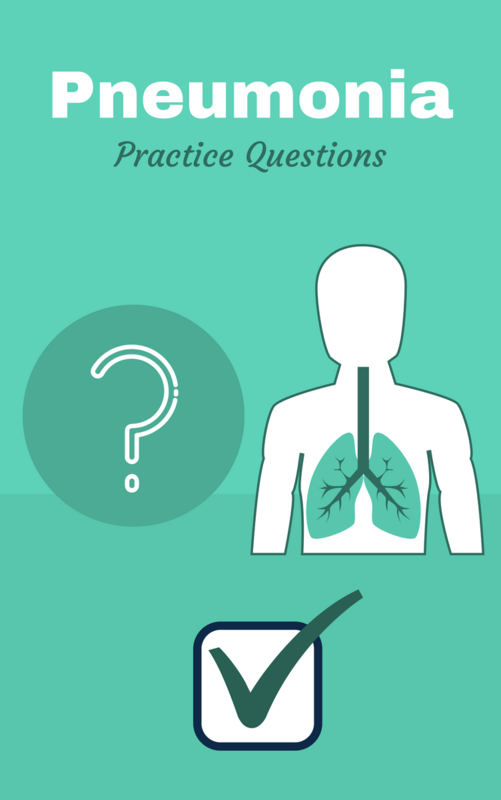 Are you looking for pneumonia practice questions that can help prepare your to ace your exam in Respiratory Therapy school? If so, good, you’ve definitely come to the right place. That is because, in this study guide, you now have access to the best information out there that can teach you everything you need to know about pneumonia. So are you ready to dive in? Pneumonia is an inflammatory condition of the lungs primarily affecting the alveoli which may fill with fluid and pus. It is an acute infection of the lung parenchyma. 2. What are the symptoms of pneumonia? High fever and chills, headache, loss of appetite, mood swings, cough with sputum, shortness of breath, joint pain, fatigue, and aches. 3. What are some ways to diagnose pneumonia? Chest X-ray and sputum cultures, CBC, and ABG. 4. What is the assessment of viral pneumonia? Low-grade fever, non-productive cough, WBC normal to low elevation, less severe than bacterial. 5. What can be assessed on patients with bacterial pneumonia? High fever, productive cough, WBC elevated, chest X-ray show infiltrates more severe. 6. What are some ways for therapeutic management of pneumonia? Antibiotics, analgesic, antipyretic, oxygen, maintaining the airway and assessing respiratory status, encourage activity, cough and deep breathing exercise, proper hand hygiene, encourage 3L/day of fluids and high Fowler’s position. 7. What medication therapy can be used for pneumonia? 8. What type of pneumonia is frequently undiagnosed? 9. What are the three key signs of bacterial pneumonia? Expectoration of yellow sputum, increased white blood cell count, and the presence of fever. 10. What type of anatomic alteration leads to aspiration pneumonia? Alveolar consolidation – atelectasis – inflammation of the alveoli. 11. What term applies to the filling of alveolar spaces as a result of pneumonia? 12. The expression “walking pneumonia” is generally applied to patients with what type of pneumonia? 13. What is the most commonly found bacterial cause of pneumonia? 14. What are the clinical manifestations of patients with severe pneumonia? Chest pain, tachycardia, hemoptysis, cyanosis, hypoxia symptoms, tachypnea, and dyspnea. 15. What is the pathogenesis of pneumonia? Pneumonia can be caused by risk factors that increase colonization, smoking, chronic bronchitis, surgery and hospitalization, medications, invasive devices, and respiratory therapy equipment; micro-aspiration (during sleep or reduced consciousness); alcoholism, CNS depressant drugs, nasogastric tubes, CNS diseases; inhalation of droplet nuclei; and bacteremia. 16. What causes “walking pneumonia” and who typically gets it? It is caused by atypical organisms like mycoplasma pneumonia (no rigid wall) and chlamydophilia pneumoniae (obligate intracellular parasite). It affects young healthy adults and can present with dry and hacking cough. 17. What are some of the viruses that can cause pneumonia? Influenza A or B, respiratory syncytial virus, rhinovirus, and coronavirus (SARS, MERSCoA). 18. What are some of the fungi that can cause pneumonia? Cryptococcus, histoplasma, coccidioides, aspergillus and mucor. 19. What are some of the non-infectious etiologies of pneumonia? Carcinomas, lymphomas, vasculitis, sarcoidosis, heart failure and pulmonary embolism. 20. What are the causes of pneumonia? Bacteria, viruses, mycoplasma, fungus, parasites, fluid stasis of the lungs caused by accumulation from secondary conditions: asthma and chronic obstructive pulmonary syndrome. 21. What is the problem with pneumonia? Even with antibiotics, patients with pneumonia have a high morbidity and mortality rates with the highest incidence in 1-4-year-olds or over 65. 22. What are the types of pneumonia? Community-acquired pneumonia, hospital-acquired pneumonia, aspiration pneumonia and opportunistic pneumonia. 23. What is community-acquired pneumonia? This type happens prior to hospitalization, droplet/inhalants transmission leading to infection leading to pneumonia by fluid accumulation. 24. What kind of therapy must be started? Empiric antibiotic therapy needs to be started as soon as possible. 25. What is hospital-acquired pneumonia? This type of pneumonia is a ventilator associated and health care associated and happens at least 48 hours – 72 hours or more after admission to the hospital. 26. What is the pathophysiology of pneumonia? Trigger an inflammatory response which increases in blood flow and vascular permeability that allows for neutrophil activation of offending organisms. Microorganism enters the alveoli and grows in the lung leading to an inflammatory response. These responses are exotoxins produced by a bacteria; cell lysis caused by a virus or death of alveolar macrophages and dumping of their lysosomal contents in the alveoli (due to the growth of an organism in the phagocyte). Vascular permeability increases due to PMNs and serum components. The alveolar macrophages are recruited to the area of inflammation. 27. What is the inflammatory response? More neutrophils are activated (cascade effect) resulting to edema of the airways and fluid leaks from the capillaries to the alveoli. This affects normal oxygen transport. 28. What are the mechanical barriers from a bacterial infection? Mechanical barriers include air filtration, epiglottis, cough reflex, and mucociliary response; reflex bronchoconstriction; and, secretion of immunoglobulins A and G and alveolar macrophages. 29. What are the various risk factors? Pneumonia is caused by a weakening of processes such as loss of consciousness (intubation), air pollution, and tobacco use, older than 65 > 70, abdominal/thoracic surgery, bedrest/immobility, chronic disease/illness, ventilators, alcohol use, immunosuppressed and institutionalization. 30. What is aspiration pneumonia? It is an abnormal entry of secretion of substances. 31. What is opportunistic pneumonia? It is a type of pneumonia commonly seen in immunocompromised individuals, such as HIV, those receiving radiation therapy, chemotherapy, and long-term corticosteroid therapy. 32. What are the sudden symptoms? Sudden symptoms include fever, shaking chills, sob, tachypnea, cough, purulent sputum (yellow/green), and pleural cerebral palsy. It is a bacterial pneumonia feature. When the normally air-filled alveoli becomes filled with fluid and debris, the mucous production increases, which can potentially obstruct airflow and impair gas exchange even further. 34. Why is antibiotic therapy beneficial for pneumonia? Macrophages break down the bacteria and process the debris, lung tissue is allowed to recover and gas exchange returns to normal. They help to result in homeostasis and healing occurs if there are no other complications. 35. What are the diagnostics for pneumonia? Chest x-ray, sputum culture, sputum gram stain (priority), blood cultures, WBCs, and ABGs. 36. What are the typical treatment options for pneumonia? Antibiotics, IVF and PO hydration, supplemental O2, analgesics, antipyretics, nutrition-frequent small meals and balance rest with activity. 37. What are common practices that patients with pneumonia should learn? They need to learn hand hygiene, cough etiquette, balanced diet, adequate rest and to stop smoking. Pneumonia vaccination every 5-10 years and encourage yearly vaccine. 38. What are the various complications of pneumonia? Atelectasis, pleurisy, bacteremia, meningitis, acute respiratory failure, sepsis/septic shock, empyema/lung abscess. 39. What physio event triggers the clinical syndrome of pneumonia? The host’s immune response leads to the inflammatory mediators which create alveolar capillary leak. This leak results on rales on auscultations, hypoxemia, and chest x-ray infiltrate. 40. What type of pneumonia is more common in children and young adults? 41. What type of pneumonia is more common in adults and elderly? 42. What type of pneumonia is commonly found in people with HIV? 43. What are the most common forms of pneumonia in neonates (0-1 month)? Group B Strep and HSV. 44. What is the most common cause of pneumonia in infants (1-6 months)? Bordetella pertussis and chlamydia trachomatis. 45. What is the most common cause of pneumonia in children (6 months – 5 years old)? 46. What is the most common pathogen found on a young, healthy adult contracting pneumonia? 47. What is the most common cause of pneumonia in older adults? Strep pneumonia and H. flu. 48. What are some common physical examination findings on someone with pneumonia? Crackles or rhonchi or wheezes, tachypnea and dullness to percussion. 49. What is the one-year mortality rate of someone with pneumonia >65 years old? 50. What chest x-ray finding would indicate that the pneumonia will be difficult to treat and is life threatening? Lung abscess (pus in the lung). 51. What are the atelectasis findings on a chest x-ray? Collapse or incomplete expansion of the lung, loss of volume, Dyspnea or respiratory failure if severe and apex will usually be at the hilum. 52. What chest x-ray finding is usually associated with empyema (pus in the lung)? 53. What is a bronchogram on chest x-ray? Air filled bronchi made visible by opacification of surrounding alveoli and peribronchial cuffing/thickening. 54. What will you usually see on a CBC with pneumonia? 55. What will the ABG usually show for a patient with pneumonia? 56. What biomarkers are potentially used to help diagnose pneumonia? CRP, Procalcitonin (PCT) and more is used to identify the worsening diagnosis. 57. What is a typical work-up of suspected pneumonia? Good medical history and physical examination, laboratory, PA and lateral chest x-ray, microbial studies – culture and gram stain and blood cultures in a hospitalized patient with sepsis. 58. What should true sputum show when trying to find the cause of pneumonia? An abundance of inflammatory cells, no squamous epithelial cells and large numbers of a single organism. 59. What pattern of pneumonia will have entire lobe consolidation and is commonly caused by Klebsiella? Lobar. It can usually be seen in bronchograms too. 60. What pattern of pneumonia is multifocal and patchy and usually seen with staph, strep, and h. flu pneumonia? 61. What pattern of pneumonia is caused by viruses? Interstitial that is characterized by a ground glass appearance. 62. What are the four most common symptoms of pneumonia? Productive cough, shortness of breath, chest pain, fevers and chills. 63. What are the different categories of pneumonia? Acute vs chronic (time), typical vs atypical (clinical characteristics), alveolar vs interstitial (x-ray pattern) and community-acquired vs nosocomial (location of illness onset). 64. What are the types of hospital-acquired pneumonia? Hospital-acquired (HAP), ventilator-associated (VAP) and healthcare-associated (HCAP). 65. What type of pneumonia is considered community-acquired (CAP)? Pneumonia that develops outside of the hospital setting. Most commonly caused by bacteria that traditionally has been divided into 2 groups (typical and atypical). 67. What are the typical and atypical organisms associated with community-acquired pneumonia? Typical involves S pneumoniae (pneumococcus), which is the most common cause requiring hospitalization, Haemophilus and Staphylococcus species. While atypical is caused by legionella, mycoplasma, chlamydia species and pneumocytis jiroveci (associated with HIV diagnosis). 68. What factors impair pulmonary clearance of pneumonia? Viral upper respiratory tract infection, smoking, alcohol, uremia (raised levels of urea and other nitrogenous waste compounds in the blood), and bronchial obstruction. 69. What is the difference between typical (virulent) and atypical pneumonia? Typical has an abrupt onset characterized productive cough with purulent sputum, pleuritic chest pain, impressive physical findings, leukocytosis with left shift or leukopenia, abdominal pain and high fever. This type responds to beta-lactams. While atypical has a gradual onset that presents nonproductive/dry cough, sub-sternal chest pain, unimpressive physical exam, WBC count normal (no left shift), and nonspecific symptoms (headaches, malaise, nausea, vomiting, diarrhea, interstitial or patchy infiltrate). This type responds to macrolides and quinolones. 70. What indications are observed to determine the type of organism that caused the pneumonia infection? Patients are observed by their chills, relative bradycardia and sputum. For chills, a single chill suggests S. pneumoniae while multiple chills suggest S. aureus or K. pneumoniae. For relative bradycardia, association with viral infection, mycoplasma pneumonia, psittacosis, tularemia, and legionella spp. Sputum is identified if rust-colored sputum or currant-jelly. Rust-colored sputum suggests association with infection by S. pneumoniae while currant-jelly sputum is associated with infection by Klebsiella species. Foul-smelling or bad-tasting sputum is often produced by anaerobic infections. So there you have it. You now access to all the pneumonia practice questions that you need in order to pass your exams in Respiratory Therapy school, and even the TMC Exam when that time comes. The best part is, it’s all listed out for you right here at your finger tips in this study guide. I hope this information was helpful for you and if you use this knowledge wisely, I know it will be. Thanks for reading and I will see you in the next post. Breathe easy my friend!